We now how the DJI Ronin stabilizer for rent! Direct competitor with the Movi, the Ronin offers a great mix of ease of use, quick calibration, and best of all a very low price! And unlike some of the cheap competitors, it’s amazingly smooth, quiet and reliable! Also, it has the benefit of being able to fly anything up to a Red Epic or Scarlet. Sorry Ursa fans, there’s no chance it’s going to fit. You can find rental details and pricing on our GEAR page in the menu bar above. While we don’t offer private instruction on the Ronin, we do offer a free half day at the start of any shoot for you to familiarise yourself with setup and calibration. And if you really love it we also have an option to purchase the DJI Ronin in Vancouver. Ask for details. 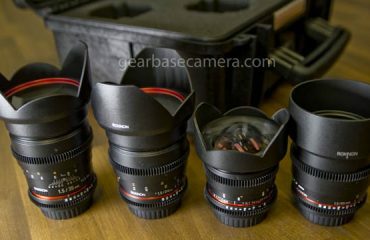 Rokinon cine lens kit in rental stock!